NIOS DELED 2nd exam Fees submission has been started. As per latest notification, the second examination of Diploma in Elementary Education for in-service teachers has been scheduled to be held in the month of September 2018. The learners have to submit the second examination fees of 504 & 505 deled courses online at the official website only at http://dled.nios.ac.in. 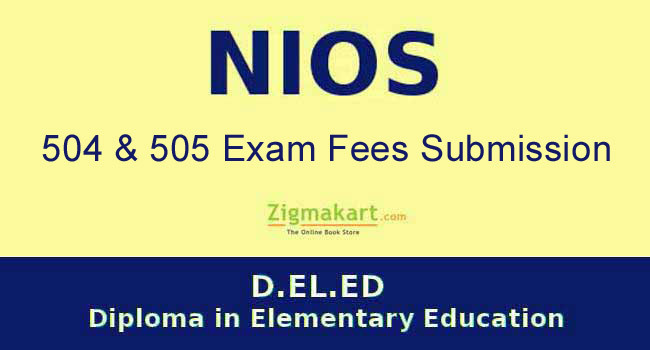 The examination fee for each NIOS DELED course is Rs.250/-. Therefore, the learners have to pay total sum of Rs.250 x 2 = Rs.500/- to register them for the second year examination. The learners who have not registered them for first semester examination of 501, 502 & 503 courses can also fill up examination fees of these examination along with 504 & 505 courses. The NIOS deled first semester exams were held earlier on 31st May, 1st June & 2nd June 2018. In this case, the applicants are required to pay fees for 5 courses. i.e. Rs.250 x 5 = Rs.1250/-. The NIOS will accept the DELED 504 & 505 examination fees till 31st July 2018. Also, for all the 5 courses 501 to 505, the last date of NIOS deled exam fees submission is same. The students who have already registered & appeared in the first semester examination of 501, 502 and 503 or those who are absent in any of the examination are waiting for NIOS DELED result 2018. If they become unsuccessful in any of the subject after declaration of result, they will be again given an opportunity to apply for examination of 501,502 or 503 along with courses 504 & 505. The exams will be held in the month of September 2018. An additional 10 days of time will be provided to all these learners apply for examination and submit exam fees after declaration of result. Step 3: After that you have to select the Medium of Instruction. Step 5: If you have taken admission in NIOS in Class XII then provide the Reference no or Enrolment no (if you have got the same)of Class XII Admission, Do not mention the Reference no of the D.El.Ed admission. Step 6: In the next step, you have to click on the “Submit” button. Step 7: As soon as you hit the “Submit” button, you will be immediately redirected to payment page where you have to make online fee payment. Step 8: The applicants will get “payment is successful” message on successfully making the payment. They are advised to take print out of same.